Alcorn, Benton, Chickasaw, Clay, Itawamba, Lee, Monroe, Pontotoc, Prentiss, Tippah, Tishomingo, Union, and Webster Counties. Calhoun, Coahoma, Desoto, Lafayette,Marshall, Panola, Quitman, Tate, Tunica, and Yalobusha Counties. 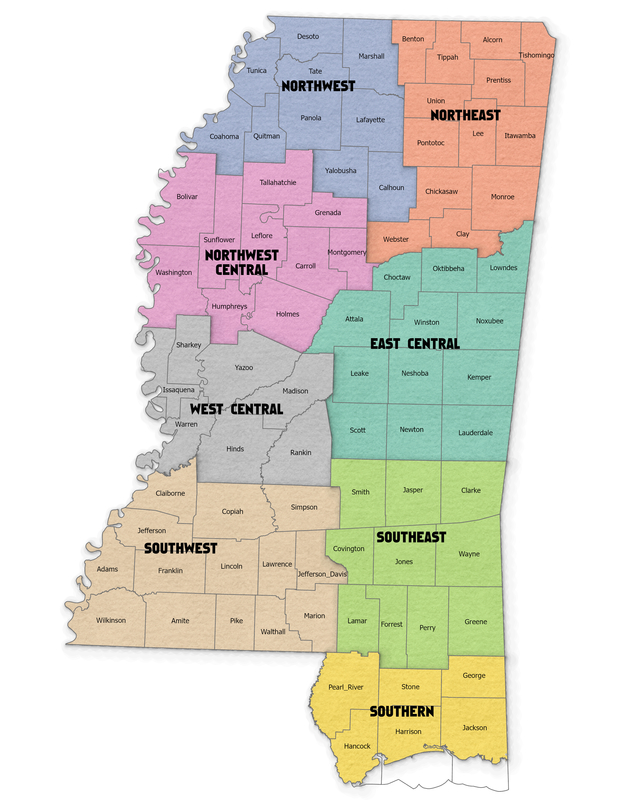 Bolivar, Carroll, Granada, Holmes, Humphreys, Leflore, Montgomery, Sunflower, Tallahatchie, and Washington Counties. Hinds, Issaquena, Madison, Rankin, Sharkey,Warren, and Yazoo Counties. Attala, Choctaw, Kemper, Lauderdale, Leake, Lowndes, Neshoba, Newton, Noxubee, Oktibbeha, Scott, and Winston Counties. Adams, Amite, Claiborne, Copiah, Franklin, Jefferson Davis, Jefferson, Lawrence, Lincoln, Marion, Pike, Simpson,Wathall, and Wilkinson Counties. Clark, Covington, Forrest, Greene, Jasper, Jones, Lamar, Perry, Smith, and Wayne Counties. George, Hancock, Harrison, Jackson, Pearl River, and Stone Counties.